The product consists of 24 signs with playful, yet direct, messages for those around you. 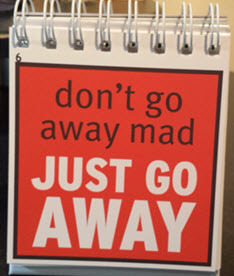 Messages include: Please LOL elsewhere, I’m in the flow, Don’t go away mad, just go away, I’m on deadline, Webinar in progress, Come back in 15 mins – with coffee, etc. She sent along a DeskMate at no charge to me since I mentioned that I would review it on my site as I am always looking for different products in the marketplace that solve problems for people like me who work in an office setting. So, if you click on a link or image in this article and decide to buy a DeskMate, I will receive a small commission at no extra charge to you. The problem that Sue is looking to solve with DeskMate is the problem that a lot of us find in any office, let alone an open office – being able to concentrate with sounds, conversations, and all sorts of distractions going on around us. 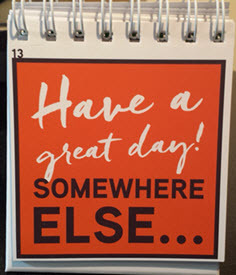 After checking out the various signs available, there are 24 in all, I knew right off the bat that the person who developed this product lived the office environment. I’ve been working in cubicles my whole working life (except for a brief stint in an office with a door years ago) and I understand the challenges of being able to focus so that I can complete projects on time. A lot of the signs within DeskMate are humorous (I can help. Just bring chocolate! 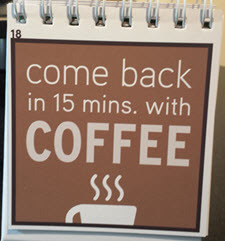 or Come back in 15 mins. With Coffee) while others are blunt and to the point (Don’t go away mad just go away or Have a great day! Somewhere else…). I love the fact that there is a mix of signs that you can use at any time. I particularly like the I’m Working from Home sign as I am privileged to do this 2 out of my 5 working days and can leave this sign on my desktop when I am working from home. I put together a quick YouTube video below which will give you a really good idea of the signs available. One of the most useful signs available is one in which you can write on the sign with a dry erase marker to let people know when you will return and who they can contact while you are out. You’ll see this particular sign at the very end of the video. You can check out my YouTube Video below. Message displays from front and back. 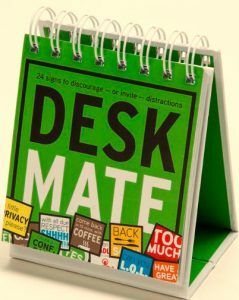 If you want to buy a product that will help you be more productive and add to the communication in your office setting, DeskMate should do just that! If you have any questions or comments feel free to leave them in the comments below or use my Contact Me page. Thanks for your dropping by! I think the closest thing I know of that may suit your needs is located at a site owned by a friend of mine and the site is called Cube Stuff. This link https://cubestuff.com/collections/cube-signs-1 should get you to a bunch of different signs and I think most of them are 5X10 which is really close to your request. I don’t know of any more that are bigger than that! If you use a coupon code of bliss at checkout you should still be able to save 10% on your order. Let me know if this works for you!